Measures 5 1/4 x 7 3/4 inches. Invoke Arts - All stamp images are designed and made in California! 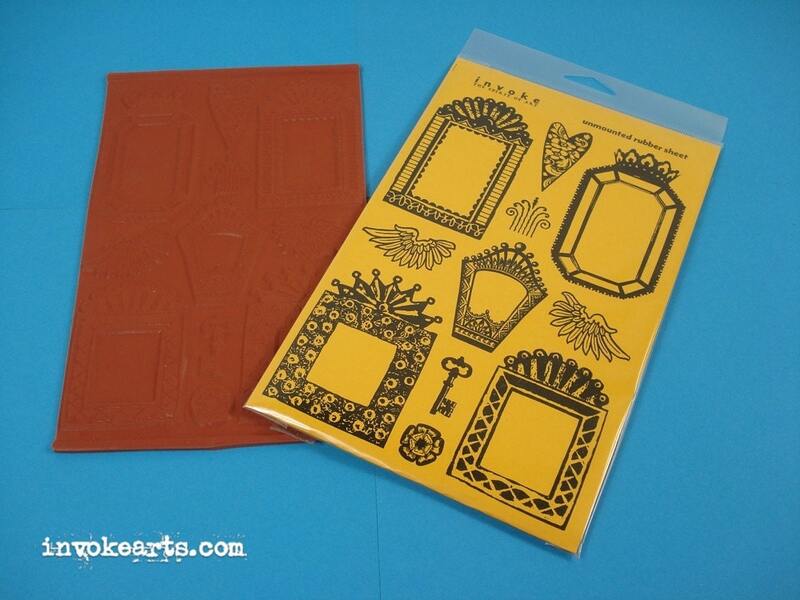 When stamped these frame stamps make great additions to your Journals, Mixed Media and Collage pieces or to a Scrapbook Page. Any samples pictured are shown to give you ideas and are not included with your purchase. Shipping upgrade: Priority mail is $7.10 for as many stamps as you would like. If you pay more than .75 more than the cost of mailing we will refund you the difference. If you are outside the U.S. we offer first class International mail or International Priority Mail at check out OR please let us know: what you would like and your mailing info city and country, we can give you a mailing cost quote for your order, it might take a few days to get back to you. The item arrived promptly and is just what I was looking for. Perfect for pocket letters and other paper crafts. Thank you! Very please with these stamps. Looks like just what I ordered. Came quickly. Love that your stamps are unusual/interesting compared to the general items available in box stores! Payment for your Etsy order can be made by PayPal, Credit Card (if you do not have a Credit Card you can still pay via PayPal) Direct Checkout or Etsy Gift Card. Payment should be made at the time of purchase. If we have not received your payment within three days we will cancel your order. Please let us know if there is a problem and perhaps we can work something out. If your order is being mailed to an address within the state of California Sales Tax of 8% is added to your order. We are careful to package you items in a travel safe manner. If you have questions concerning your order please contact us via Etsy. We will work to resolve any issues. Please convo us within 3 day of receipt and contact us before returning any items. No Returns on Grab bags and Sale items. We ship via United States Postal Service. Delivery Confirmation is included in mailing cost for all orders within the US. We have two options for orders within the United States. 1. Mailing cost is for first class mail, if we have charged you more that what actual postage is we will refund you the difference. 2. Priority mail is $5.75 for as many stamps as you would like. what you would like and your mailing info along with your phone number. We will give you a quote for your order.